Anastasios Spanidis is Co-Founder and CEO at Generation Y – International eBusiness Experts. His academic background consists of his Bachelor’s Degree in Electrical Engineering and a Master in Science in Sales Psychology, from the Metropolitan University of Leeds, UK. He established Generation Y – International eBusiness Experts at the age of 18. During the past 18 years of delivering thriving results to its respected clientele, Generation Y, has flourished to a dominant international agency on its sector, with active clientele in 24 countries and operational offices in 7. 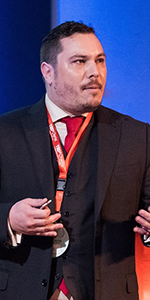 His leading position in the business sector, has led him to become a public speaker and influencer, for over 15 years, having participated in more than 150 conferences so far, while also being a prominent TED speaker.Anastasios Spanidis’ entrepreneurial mentality acts as a forceful drive, which among others, positions him as an investor, shareholder, or a member of boards of directors, in various household Greek and international companies. He is a regular member of the steering committee for the Leadership sector of the Greek Management Association and has shared his experiences and valuable knowledge by the standpoint of a professor at various private Universities and Institutes.